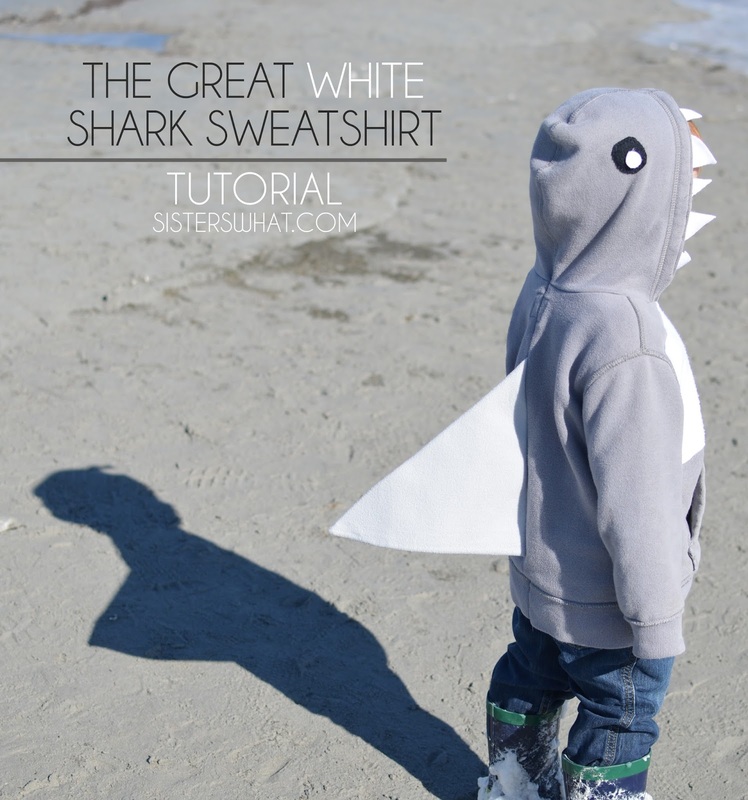 ' The Great White Shark Sweatshirt [for kids] - Sisters, What! Our little Mr. 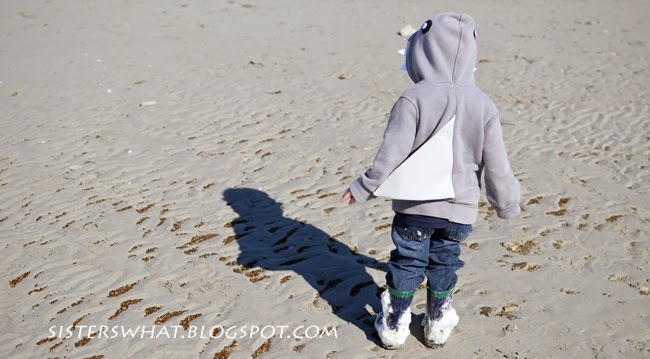 Awesome has been in love with sharks for almost his whole life (that's a long time for someone his age). 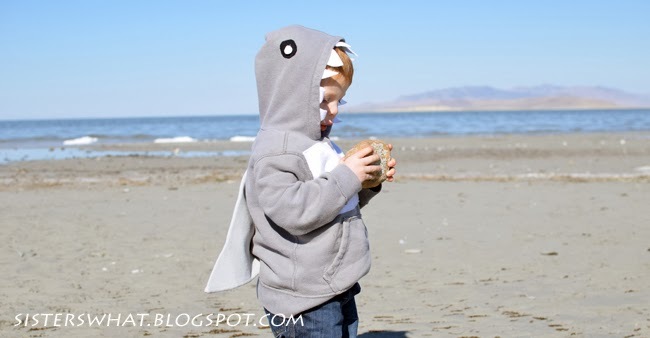 So for Halloween this year I thought that he'd love being a shark. Yep, he is still the wonderful young age of not knowing that he could have a choice in a costume. I've seen online some dinosaur sweatshirts just made out of an old child's sweatshirts and I figured I could do the same thing but make it a shark instead. I loved the idea of his Halloween costume being super easy and something that he could wear all the time and not just on Halloween. It probably took me just a half hour total. It would have gone faster, but little Awesomeness decided that he wanted to help me make it. It was the perfect project for him to sit and 'help' me. 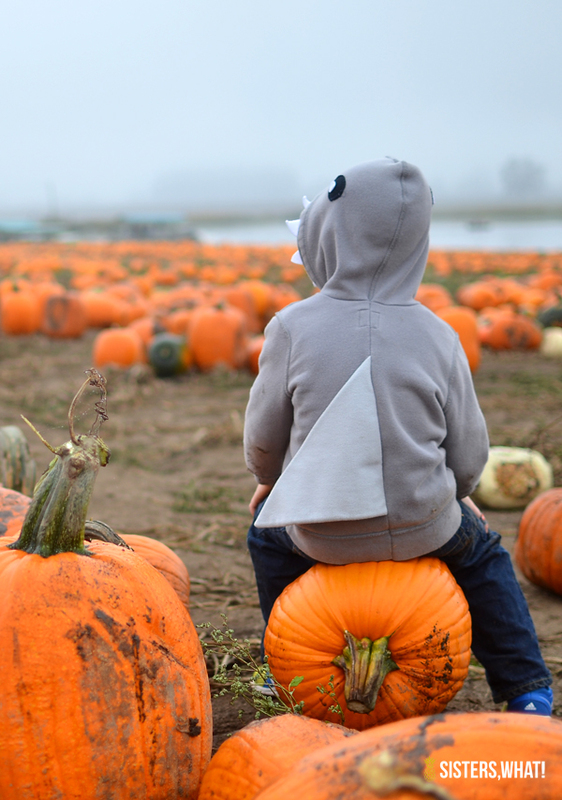 He thought it was so cool and immediately after I finished the shark sweatshirt he then asked me "make dinosaur sweatshirt now?" He absolutely loves the sweatshirt and will walk around and say "du-nu, du-nu" (jaws theme song) and then growl at us. Ya I know, sharks don't growl, but he thinks they do. I found this sweatshirt at goodwill. I wanted a zipper one, but I couldn't find one that was grey and the right size. As you can see, there is writing on the front. To cover it up I just sewed a piece of fleece on top. After I sewed it on I realized that it was a little crooked at the bottom. So annoying. I was about to pick it out, but then I realized that it gave it some character (or I was just lazy and trying to justify not redoing it). >1< Take your grey fleece and cut an 8 inch square. I actually did a 9 inch square but I found that the fin was just a little too big, but I think 8 inches would be perfect. Fold your square in half and trace the triangle shape onto the pellon and cut the triangle out. >2< place the pellon on top of fleece triangle and sew just one of the short sides of the triangle shut. Make sure you sew the pellon with it. Then turn the triangle right side out. The pellon will be flipped to be hidden on the inside of the fin. >3< Find the very middle of the back of the sweatshirt and cut up until you are an inch away from the hood. Then turn the sweatshirt inside out. 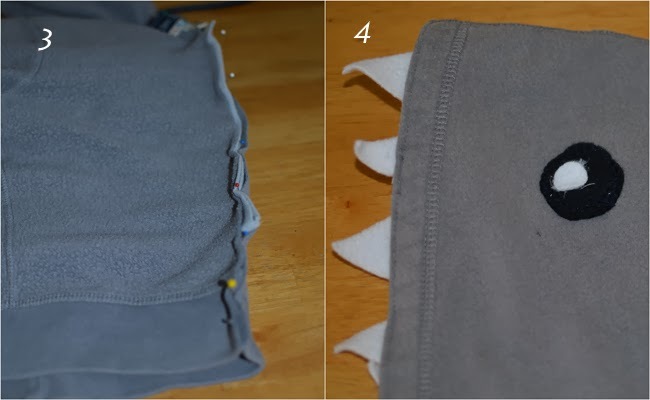 Place the fin so that it is inside the sweatshirt and line up the raw un-sewn fin edge with the edge of the sweatshirt and pin. Then sew the back of the sweatshirt back up. >4< For the teeth, cut 8-10 small triangles of varying but similar sizes. Then pin them on to the edge of the hood and sew them on. For the eyes, I sewed on the black felt circles but hot glued the white circle. Now enjoy watching your little shark run around. 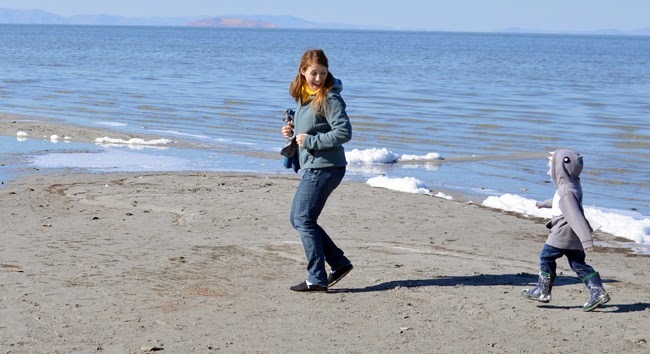 Around here we like to play shark tag.